Terrell Flowers couldn’t find a job after high school. He filled out dozens of applications and never got a call back. So at the age of 20, he decided to go into business for himself. After spending summers working alongside his grandfather in landscaping, Flowers asked for seven properties to manage, so he could go it alone. Once he was working on his own, FGS Landscaping began to grow and Flowers found he needed more knowledge to handle the business side of things. 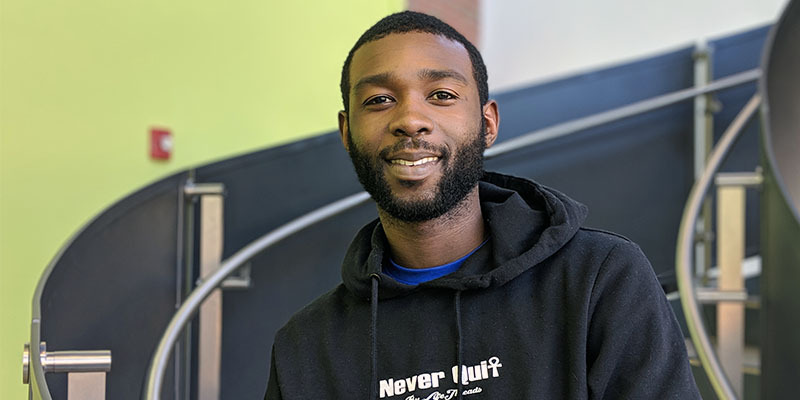 He enrolled in Tidewater Community College’s business administration transfer degree, while taking electives in small business management. Professor Gillerlain with business students on the Chesapeake Campus. The Career Studies Certificate in Small Business Management and Entrepreneurship includes classes in Accounting for Small Businesses, Principles of Supervision, Small Business Management, Marketing for Small Business and Entrepreneurship. 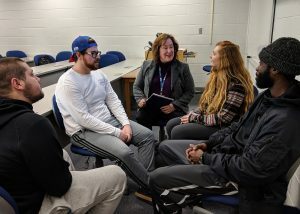 “This specialization is important for people who want to start a business or currently run a small business,” said Kelly Gillerlain, professor of business administration at the Chesapeake Campus. “The degree allows students to focus on small business practices and principles and was actually created by faculty across the college because of student interest and requests for these types of classes,” she said. It didn’t take long for Flowers to grow his business to 47 properties, 44 residential and three commercial. He now employs three people and offers additional services, including mulching, tree and shrub care, tree trimming, yard renovations and flower installation. Flowers said the targeted classes in small business topics helped him streamline processes and run an efficient business. “Aside from book knowledge, I’ve made some great contacts and friends at TCC who have helped me on this journey,” Flowers said. Flowers credits his professors with challenging him to think outside the box. His favorite professor was Karen Pryor, now retired, who taught English. “I learned how to write in her classes. She believed in me, and I knew if I could pass her class, then I could get through college,” Flowers said. While it’s taken some time, Flowers is just five classes shy from earning his associate degree. The Oscar Smith High graduate is the first male in his family to go to college. He’s following in his grandmother’s and mother’s footsteps, as both earned college degrees. For more information about the Career Studies Certificate in Small Business Management, contact Gillerlain at kgillerlain@tcc.edu.